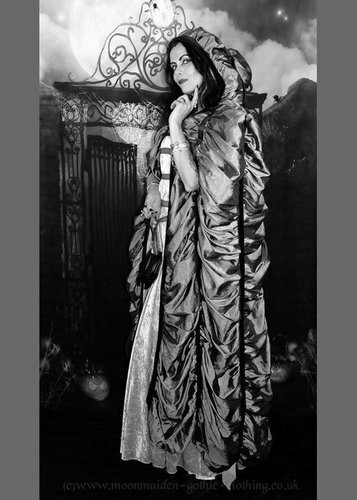 Here's our original LILY MUNSTER GOWN! It's a complex dress that had to be done properly - so we've worked our Moonmaiden magic. Made from Lilac crushed velvet with lycra mesh sleeves, the gown has more fabric in one arm than some of our full length dresses do! Let's start with the skirt - it's bias cut "Lunaria" style; with an incredible hem that goes on for miles - just give it a swoosh and you'll see what we mean! The bodice has the classic Lily neckline, trimmed with both black braiding and ghoulish purple binding - then there are gathered panels under the bust, also trimmed with binding to get the perfect munstereqsue look, together with a belt-effect at the waist. 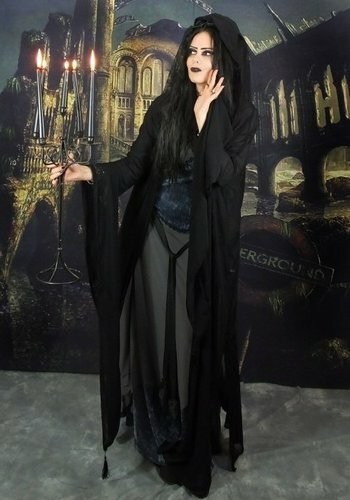 And if that doesn't convince you that you *need* the Lily Gown, then watch the video and fall under her spell!